The time is the 1870s. The place is the American Southwest and, in flashbacks, China. The stories follow Kwai Chang Caine, a half-Chinese, half- American Shaolin priest, an expert in the ancient Chinese art of Kung Fu ("It is said a Shaolin priest can walk through walls. Looked for, he cannot be seen. Listened for, he cannot be heard. Touched, he cannot be felt."*3*). 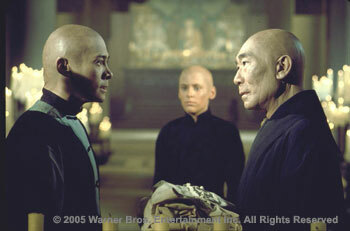 Caine had been raised/trained mostly by Master Kan and Master Po at the Shaolin Temple in the Honon Province of China. But he had to leave the country after killing the Emperor's*1* nephew (who had shot and killed Master Po). Once in America Caine learns he has a half brother. While searching for Danny Caine, Kwai Chang Caine is sought by Chinese assassins and American bounty hunters (who are after the $10,000 reward that China, in widely distributed wanted posters, offers for his capture - only $5,000 for his death). A notation such as *1* refers to a note at the end of this guide, as does the symbol [F] which refers to the translation of the TAO TE CHING. An underlined space represents a hole - words missed which are still needed to complete the quote (in the ASCII version there will just be a space). Three or four periods in a row represents a word or words deliberately left out which added nothing to the sense. A parentheses around such a row of periods is for part of a quotation which the show left out (sometimes the words are inserted in brackets). Included under the 'INFORMATION' sections (at the end of some of the episodes) are some selected quotes from Herbie Pilato's Kung Fu Book of Wisdom*2* which he got from the scripts but, however interesting they may be, if they do not come from the actual broadcasts, they are not Canon! Although played by Carradine, Caine is seen by everyone in the series as looking Chinese. Guest actors throughout the series play different roles. Also some flashbacks are reused, occasionally with different dialogue. Most stories take place in California, Arizona or New Mexico although a few stories are set in Sioux country and once Caine goes across the border into Mexico. Quotations were picked for several reasons including the philosophy and also the sense of the characters, who they are and/or how they speak.